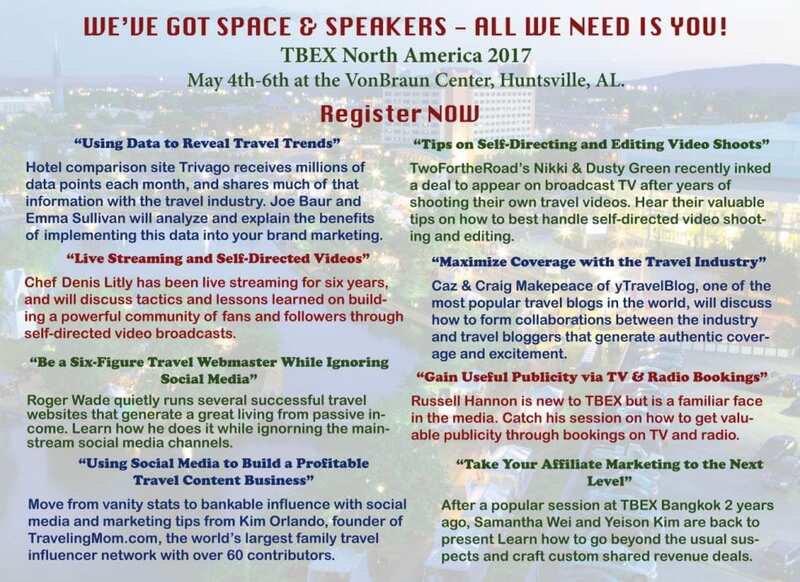 A few weeks ago we posted our first lineup of speakers and breakout sessions for TBEX North America 2017. Here’s more of what we have in store … from TripAdvisor’s session on implementing data points into your marketing and content strategies to Affiliate Marketing to self-directed videos and editing tactics to forming collaborations with the mainstream travel industry, these breakout sessions are brimming with trending technology, topics and travel content strategies! And by the way … our keynote speakers are gonna ROCK the Rocket City! Bruce PoonTip of G Adventures and TV host/world traveler Samantha Brown have BIG ideas and even BIGGER things happening behind the TBEX scene in Huntsville. Will you be a member of the world’s largest travel blogger conference, or will you just watch it from the social media sidelines?